Tesla CEO Elon Musk unveiled the company's Model Y on Thursday but Wall Street received the crossover SUV electric vehicle with little fanfare. "Overall, we found the event somewhat underwhelming with no major surprises," Deutsche Bank's Emmaneul Rosner said in a note. "We remain concerned about the manufacturing timeline," Bernstein's Toni Sacconaghi said of the Model Y. "Overall, we found the event somewhat underwhelming with no major surprises," Deutsche Bank's Emmanuel Rosner said in a note. The Model Y will use about 75 percent of the same parts as Tesla's low-cost Model 3, CEO Elon Musk said. That makes the Model Y "likely to cannibalize the Model 3," Morgan Stanley analyst Adam Jonas said. Cowen analyst Jeffrey Osborne also said the "Model Y reveal underwhelmed us," especially since "the night held no surprises." Osborne said investors were looking for a refresh to the Model S and Model X lines, new software or even details on how Tesla's first quarter is going. "We remain concerned about the manufacturing timeline," Bernstein's Toni Sacconaghi said of the Model Y. "Last night's unveiling essentially reaffirmed Tesla's target of 'volume' production by the end of 2020." 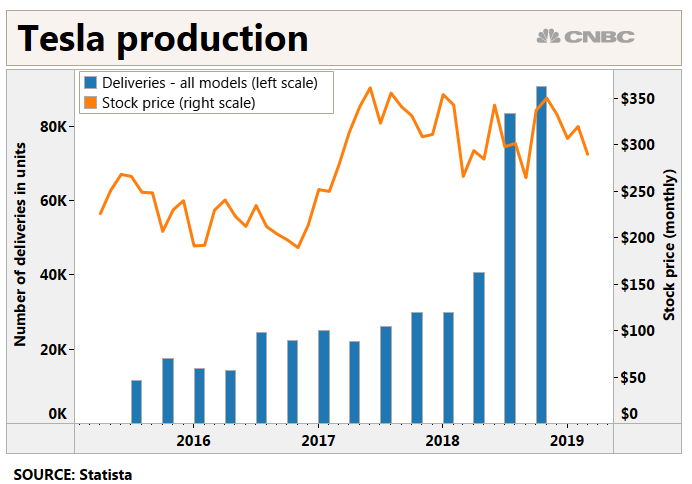 A few analysts stuck to bullish sentiment on Tesla as a whole, exemplified by Baird's Ben Kallo, who said his firm continues "to like TSLA into the Q1 delivery release, as we think the negative sentiment on Model 3 demand and Q1 deliveries is overblown." "Likely to cannibalize the Model 3, in our opinion. The Model Y offers substantially greater space, nearly identical performance, and nearly as much range as a Model 3… and it has 2 extra seats in a 3rd row which is a very big deal, especially for the US market ... Pricing of Model Y is modestly more (less than 10% more?) than the comparable Model 3... and many might argue you get a lot more bang for the buck in the Y ... With this potentially bullish catalyst out of the way, we anticipate a cautious narrative to resume its course until Tesla can put to bed market concerns over near-term demand, cash flow, and liquidity." "No major surprises with the car. As expected, the car looks very similar to the Model 3 (picture a Model 3 plus an SUV bulge in the back) ... We remain concerned about the manufacturing timeline. Last night's unveiling essentially reaffirmed Tesla's target of "volume" production by the end of 2020. This timeline appears similar to the original timeline for the Model 3 ramp, which was ultimately delayed by 9-12 months. That said, Model Y could enjoy a smoother ramp due to its shared platform ... That said, Tesla does appear modestly better prepared this time around." "With the Model Y vehicle only priced at a $4k premium to the Model 3, we think investor focus will hone in on potential cannibalization of already waning Model 3 demand and the company delivering on margins as it moves to larger scale production. And with no incremental products unveiled (like the pickup truck the company is working on or a potential refresh of the S/X) and no further commentary on Model 3 demand (which investors have been looking for), we think shares could see pressure in trading today. ... we estimate the company is likely to see between 200k and 400k orders (in totality) for the product given consumer preferences for utility vehicles vs. sedans." "Tesla's Model Y reveal underwhelmed us ... The night held no surprises - no S/X refresh, no new software, and no details on 1Q19 ... We believe investors will leave the Model Y launch with a neutral to negative outlook on the Tesla story for multiple reasons ... We believe the event was more of a capital raising effort and branding exercise. We do not see the new Model Y igniting elevated demand or enthusiasm for the Tesla brand ... There was no refresh of the S/X platform ... There was no "one more thing" - nothing incremental to get the Tesla bulls excited." "Although the Model Y is unlikely to be available to consumers until at least 2020, it will likely represent one of TSLA's most important models, as it caters to the currently very hot crossover market (in the US and globally). However, it should be noted that all automakers are increasingly chasing the CUV segment and will be launching a slew of new models, which will likely drive an overcrowded market. This will eventually lead to pressure on price, margins, and returns for the entire industry." "Model Y may be most important vehicle in Tesla's history, addressing fastest growing US segment at a lower cost than S ... We expect Model Y to see strong sales but with an expected launch in late 2020; the key is what will drive demand until the Y launch – we see new geographic releases and existing model refreshes of S & X staggered across the next couple of years driving sales." "Overall, we found the event somewhat underwhelming with no major surprises ... All in, we believe this event will not detract investor attention from ongoing demand/margin concerns for Tesla's current lineup, and with 1Q19 earnings and cash flow set to be really weak, the stock could remain under pressure in the near term. Beyond it, Tesla will need to demonstrate acceptable gross margins on Model 3 including some standard range models, which could take time and will be very mix dependent." "The Model Y Unveil proved long on recapping TSLA's corporate history with few surprises in the vehicle ... We believe timing, specs, and price range are largely in line with investor expectations and that many questions remain about capex needs, manufacturing logistics, and depth of demand. We would expect shares to be flattish on the event." "We believe solid performance specs should position the vehicle well in the attractive and growing market for premium/luxury SUVs. The announced production timeline was in-line with our expectations (higher priced variants will be produced first, expected in Fall 2020) and the company has begun taking orders for a $2,500 deposit. We continue to like TSLA into the Q1 delivery release, as we think the negative sentiment on Model 3 demand and Q1 deliveries is overblown ... We think sales of the Model Y should be supported by growing market for premium/luxury crossovers and SUVs. We estimate the U.S. market for premium CUVS/SUVs to be over 1.5M vehicles annually, based on historical sales. We think the Model Y will be able to capture market share (similar to the Model 3) given its competitive pricing and specifications compared to other cars in the class." "Tesla unveils the Model Y but event may fall shy of whisper expectations ... The model Y is to the Model X as the Model 3 is to the Model S. A more economical and presumably higher-volume version of Tesla's X ... While we anticipate that the Model Y will take time to be a meaningful contributor for Tesla 2021, we view the design and development as further evidence that the company is moving far faster than the legacy auto OEMs and still has a commanding lead in EVs."